Coppell Veterinary Hosptial has one of the most experienced and qualified staffs in the Dallas and Fort Worth Area. Dr. William C Stearman , D.V.M. I was born in Dallas and moved onto a ranch near Hico at age 5. My graduating class only had 21 students! Then I was off to Texas A&M University. After graduating from the College of Veterinary Medicine, and with some great insight from my mother, I decided to open a practice in Coppell and built Coppell Veterinary Hospital in 1978. At that time, 635 to D/FW was just dirt! Since Coppell was still rural, I worked a lot on horses in those early days and some dogs and cats. As Coppell grew, I limited my practice exclusively to dogs and cats. I have always practiced to the highest standard, and am proud to have been recently listed in “D” Magazines Best Vets issue. My hobby, strange as it may be for a person who grew up on a ranch, is sailing which I have been doing for over 35 years. Maybe there is correlation with wide open spaces. When I'm not sailing, I love to cook and pair wine for the meal. This is a recent hobby of mine but I sure enjoy practicing! Angie writes, "I have been working at Coppell Veterinary Hospital since March of 1997 while still a veterinary technology student at Cedar Valley College. I graduated in May of 1998 and passed the state and national boards becoming a Registered Veterinary Technician in June, 1998. I am a native Minnesotan and moved to Texas in 1993. At that time, I worked as an executive assistant. After having been in the corporate and private sector for many years I came to the realization that was not the career for me. It was at that time I decided to turn my love of animals into my profession. My dog is named Josie (Shetland Sheepdog) who can be seen in the hospital daily. She has become the official greeter and treat tester. My interests outside of animals are gardening, food and wine pairing, and fishing (especially salt water). I come to work every day with my mom, Angie. I have the most important job at the hospital. If I'm not in the middle of a serious nap, I enjoy greeting you and your dog. My mom and Dr. Stearman don't let me greet the cats, although I don't know why. Anyway, I also try to calm our nervous patients and usually do a pretty good job. That "Dog Whisperer" has nothing on me. Then, once we make our way into the exam room, I ensure that enough treats are dispensed to everyone's liking (myself included). They have to pay me somehow. 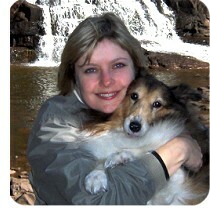 On a personal note, I came to live with my mom about 9 years ago when I picked her out at a DFW Sheltie Rescue adopt-a-thon. It's been smooth sailing ever since. So long for now, I look forward to seeing you all soon!